Even the best golf bags cannot withstand the hazards that come with movement from one place to the other whether you are using the road, air or railway and so you need something harder to keep your gear safe. A cover case is an answer to the rigorous nature of movement from one place to the other, but you still have to find a quality one. The Samsonite Hard Sided Travel Case is designed for the frequent golf traveller with a hard ABS plastic material to ensure that it can take anything that you bring its way. Even the best golf bags cannot withstand the hazards that come with movement from one place to the other whether you are using the road, air or railway and so you need something harder to keep your gear safe. A cover case is an answer to the rigorous nature of movement from one place to the other, but you still have to find a quality one. The Samsonite Hard Sided Travel Case is designed for the frequent golf traveller with a hard ABS plastic material to ensure that it can take anything that you bring its way. It is also very spacious making it possible to fit not only your precious gear but also a few extra clothes. The case also has four multi-directional wheels for smooth movement and rubber grip handles for easier handling. Wheels: The case features four multi-directional wheels that make it possible for you to push or pull it from any direction. Interior: Apart from being very spacious the interior of the case is heavily padded to offer maximum protection, and it also has compression straps to hold the bag in place. The interior also has some extra foam at the top to protect the club heads. Material: This case is made from a hard plastic material (ABS) that not only ensures durability but also protects your clubs against damages as a result of a fall or bumping into other things. 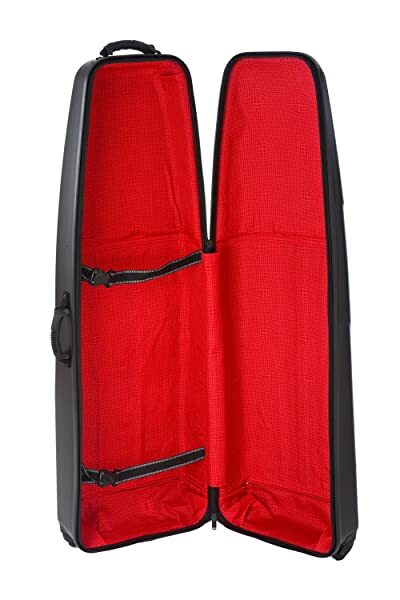 Capacity: It can accommodate large golf bags with 10.5 inches top opening and 48 inches long clubs. Colors: It comes with four color options that are red, champagne, black or titanium and hence you have the freedom to choose what is most appealing to you. 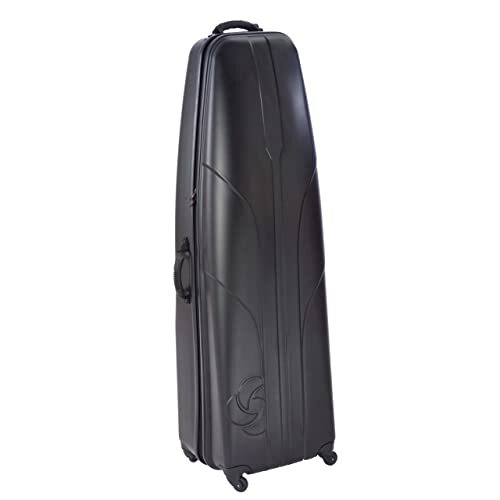 Handles: Samsonite Hard Sided Golf Travel Case has two rubber grip handles with one being at the top and the other on the side to ensure maximum convenience when handling the case. Has a solid ABS shell that makes it perfect when you are travelling for long distances. With this case, you can be assured that nothing will cause damage to your precious clubs. The four multi-directional wheels make it easy for you to move it whether you are pulling or pushing it. It is fully padded to offer maximum protection to your valuable golf gear. Apart from this, it also has internal compression straps to hold its contents in place for increased protection. Samsonite Hard Sided Golf Travel Case has some nice wheels, studs and a housing that help to ensure that the bag remains upright. Although the case is high quality, it is also massive, and so you will have a lot of trouble fitting it into the back seat of a standard size saloon car. Some people also complain that they have trouble maneuvering it when they have to handle other suitcases due to its massive size. The Samsonite Hard Sided Golf Travel Case is designed to help golfers solve mobility issues for their golf gear, especially when travelling for long distances. A golf bag can help you move your clubs around the course but it cannot handle the hazards that come with travelling, and so you need a cover case like this one. It is not just something that will cover your bag, but it has special features such as padding and straps that will keep your gear safe and some nice wheels for easy mobility. Although it is massive in size, this will not be a problem for most golfers as it means that you have more space for a few clothes. And given the fact that it is fairly priced it is worth buying particularly for a golfer who frequently travels with their gear.